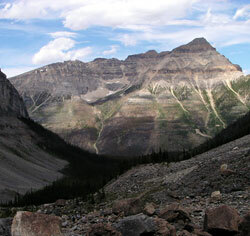 The striking peak which lies directly west of Vermilion Pass was named for Edward Whymper. 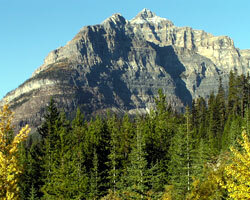 During the summer of 1901, Whymper became the first mountaineer to visit the upper Vermilion Valley. 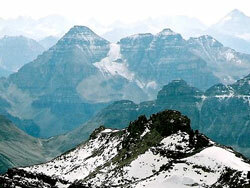 He named Stanley Peak, and also completed, together with the four guides who had travelled from Europe with him, the first ascents of both Stanley Peak and his own mountain. Compared to some of his experiences in the Alps 30 years earlier, Whymper's climb of Mount Whymper must have seemed quite simple and monotonous as a mountaineering challenge. Today the ascent is regarded only as a moderate "scramble," not requiring ropes and certainly not requiring four alpine guides. Hector appears to have been an admirer of General Sir John Henry Lefroy, an astronomer who was particularly interested in studying the magnetic declination from various locations in Canada and who eventually visited the site of the north magnetic pole. 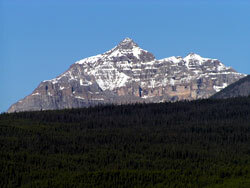 It is not clear whether the name of Mount Lefroy 'migrated' to the peak that towers behind Lake Louise or if that mountain was named without any influence from Hector?s naming of what is now Mount Whymper.